Energy drinks that promise a short-term boost to energy levels and alertness can contain as much caffeine as 14 cans of pop, which can potentially lead to dangerous health problems such as rapid heart beats, tremors and insomnia, researchers say. Energy drinks are especially popular with young people needing a pre-exam pick-me-up or a surge of energy before a sports competition. But they need warning labels that indicate the exact amounts of caffeine and warnings of the potential health effects, researchers who study the drinks say. In an article published in the journal Drug and Alcohol Dependence, Roland Griffiths and a team of scientists from Johns Hopkins University in Baltimore say that energy drinks contain between 50 and more than 500 milligrams of caffeine. "The caffeine content of energy drinks varies over a 10-fold range, with some containing the equivalent of 14 cans of Coca-Cola, yet the caffeine amounts are often unlabelled and few include warnings about the potential health risks of caffeine intoxication," Griffiths said. The researchers tested 28 energy drinks with varying results. While a can of Coke contained 34 grams of caffeine, a small can of Red Bull contained more than double that, they said. Other products contained six to 14 times the amount of caffeine in a single can. Griffiths and his team warn that consuming high doses of caffeine can lead to caffeine intoxication, which causes symptoms such as nervousness, anxiety, restlessness, insomnia, gastrointestinal problems, tremors, rapid heartbeats, restlessness and, in some rare cases, death. Caffeine intoxication is a clinical syndrome that is included in the Diagnostic and Statistical Manual of Mental Disorders and the World Health Organization's International Classification of Diseases. Most consumers don't know how much caffeine they are getting in energy drinks, which are marketed as safe beverages that provide a short-term boost to energy levels, the authors said. "It's like drinking a serving of an alcoholic beverage and not knowing if it's beer or scotch," Griffiths said. In the United States, soft drinks can only contain a maximum of 71 milligrams of caffeine per 12-ounce can, according to guidelines set out by the U.S. Food and Drug Administration (FDA). A cup of brewed coffee contains about 80 to 150 milligrams of caffeine. However energy drinks, such as Red Bull and SoBe, are marketed as dietary supplements and so are exempt from this cap. In Canada, energy drinks are sold as natural health products. They are regulated by Health Canada, which does not require that caffeine be included on a label as a separate ingredient. The energy drink industry representative in Canada says its "members' drinks are formulated to meet all Health Canada regulatory requirements," a statement from Refreshments Canada to CTV News said. "Our members' energy drinks are appropriately labelled with the recommended dose per day and the label specifies the product is for 'adults.'" The drinks include warnings that the products are not recommended for children and the companies do not advertise energy drinks in any media directed at kids, the group said. The new recommendations come at a time when the North American energy drink market is rapidly expanding. Sales of energy drinks in Canada jumped 54 per cent to $277 million in the year ending this August, according to data from AC Nielsen. In the previous year, sales jumped 71 per cent. 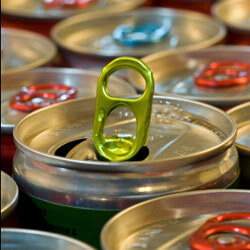 Annual sales of energy drinks in the United States are an estimated $5.4 billion. A 2007 survey of almost 500 U.S. college students found that more than half of them consumed at least one energy drink per month. Of those who consumed the drinks, 29 per cent said they experienced so-called "jolt and crash" episodes on a weekly basis, while 19 per cent said energy drinks gave them heart palpitations. As well, many young people mix energy drinks with alcohol at bars and nightclubs, which can "give users a false sense of alertness that provides incentive to drive a car or in other ways put themselves in danger," Griffiths said. These potential health concerns have sparked a backlash against the beverages north of the border. One school board in Prince Edward Island has voted to ban the sale of energy drinks to children. And prominent doctors on the Island are compiling data on the potential health ramifications of consuming energy drinks. They plan to then issue recommendations that will include a minimum age at which it's safe to consume the beverages. Current Health Canada guidelines warn that energy drinks can lead to dehydration and caution against drinking them in excess or consuming them with alcohol. Health Canada also recommends that children age 12 and under should consume no more than 2.5 milligrams of caffeine per kilogram of body weight. 45 mg for children between the ages of four and six. 62.5 mg for children between the ages of seven and nine. 85 mg for children between the ages of 10 and 12. These limits are equivalent to about one to two 355 ml cans of cola per day.